Pre-arrangement with NMS eliminates unexpected headaches that can arise at the last minute. If you’ve been in the funeral business for any length of time, you know that you can expect the unexpected. All funeral directors have their story about that one time when it all went haywire. But the best way to avoid the unexpected is to prepare. There are many cases of people requesting to have their body shipped “home” from another location for their funeral and burial. By planning everything out in advance, the process goes much more smoothly, and the family has less to worry about when the time comes. But it’s not just about the family. The funeral director benefits because the planning is arranged, all the steps have been taken to ensure that everyone is on the same page, and when the plan goes into motion, it is all taken care of. When you have already secured a company to handle body removal, ground transport, air transport, graveside services, and so on, it means you have less to take care of in the short timeframe you have from the time of the death call to the day of the services. Different locations require different timeframes as well. If you are shipping a body from Arizona, it will take less time than shipping one from Tokyo. Pre-arrangement helps you plan out the timeframe of your services so that the family will be able to be more precise when letting loved ones know about the events of the memorial. Pre-arrangement with NMS makes things easier when death occurs outside of normal business hours. In the mortuary business, our clock doesn’t exactly adhere to “banker’s hours.” By having all your ducks in a row and plans made ahead of time, the process becomes as simple as one phone call. NMS has people on staff 24 hours a day, seven days a week to process your death call, and with pre-arrangement. This allows you to have all the details in advance, and it's as simple as accessing your file folder. There is no confusion when someone is on vacation, there is no ambiguity as to a conversation that occurred three years ago, and there is no “we’ll get started first thing Monday morning.” Everything is already taken care of so you don’t have to panic if you get that 3 a.m. Saturday notification. Pre-arrangement with NMS helps you make sure all your papers are in order. Arrangements for shipping, embalming, cremation and removing a body vary widely from state to state. As you can imagine, the paperwork can vary as well, and if you don’t know exactly what you need to get things rolling, paperwork can impede your progress on planning and arrangements. While pre-arranging doesn’t allow for early submission of paperwork or payments, it does allow you to obtain the forms you will need so they are prepared when the death call is received. The last-minute changes and obstacles we spoke of earlier become even more difficult to navigate and can be even more expensive to resolve if you don’t address the forms and paperwork you need early on. Pre-arrangement helps keep everything in order and ready to go as soon as the death call information is received. Pre-arrangement with NMS helps you save money. If you can make plans in advance, you can often reduce extra fees associated with last second planning. While you might not be able to make all the arrangements ahead of time, you can save money and time by knowing exactly who will handle all the services and what the scope of their services will be. If you wait too late to research, you might end up paying more for a service that someone else could do at a reduced rate. Pre-arrangement services make the process easier on the funeral director, and that in turn makes things easier for the families. By spending some time making the arrangements beforehand, you can guarantee the family that the arrangements will be handled the way the deceased individual would want, and it will make planning at the time of the services much easier to handle. National Mortuary Shipping & Cremation can handle all aspects of pre-arrangement for mortuary services. From mortuary shipping, body removal, cremation, and embalming to ground transportation and graveside services, NMS has the experience and friendly experts that can guide you through all aspects of planning for funerals around the globe or around the corner. 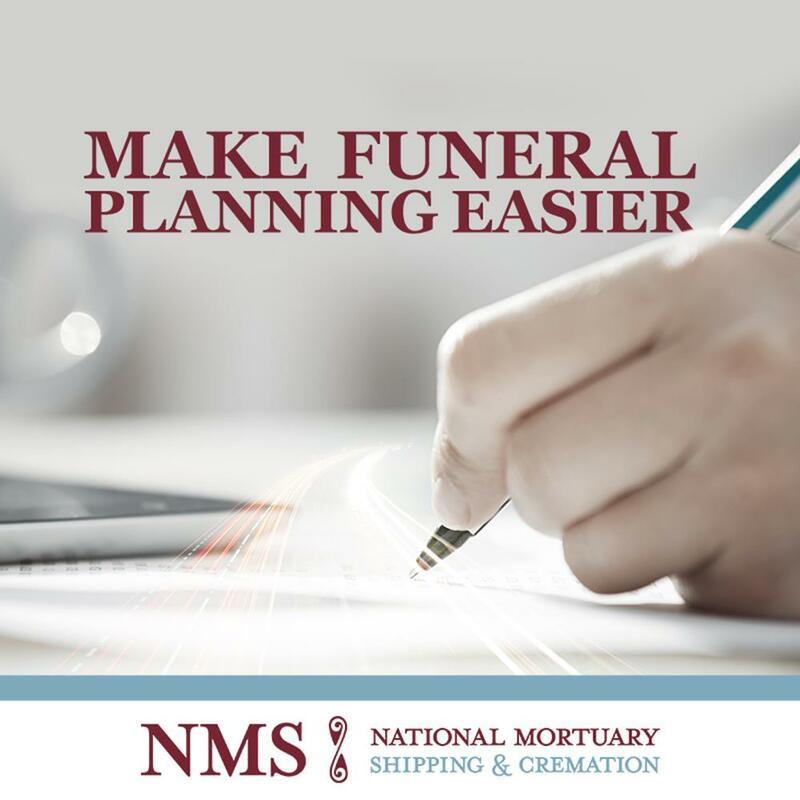 If you need help planning pre-arrangement funeral logistics for your clients, contact NMS today. Caring for every need, every day.